Sofa body in faux leather fabric. Cristina Marrone INFINITI 1860 elephant. 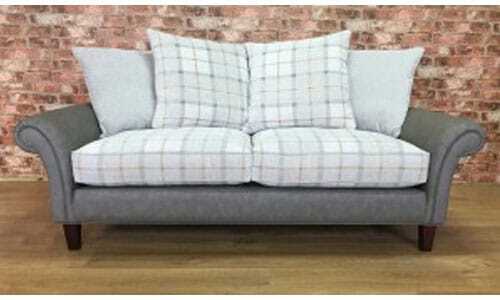 Sofa seat and 2 x back cushions fabric. J Brown RHODE ISLAND col 5 check. Sofa 2 x back cushions fabric. J Brown MAINE col 5 plain. 6″ dark plain tapered legs.